How does a school go from having one of the worst truancy records in the country to having one of the best attendance records? That’s the message that you keep hearing from staff at Co-op Academy Manchester. There is also a very direct approach from the school’s attendance team. Even if a parent rings to say their child is poorly, there could still be a knock on the door to check out the story. Jenny Robey, the school’s attendance manager, says she might be halfway up the stairs of a house where a child is supposedly off sick when the parent will admit that “she’s really in Tenerife”. The school, in Blackley, Manchester, used to send out a minibus to bring back all those caught dodging school. The principal, Steve Brice, says a radical improvement on attendance was a key part of turning around the school. “If children are not in the building, they’re not learning,” he says. Any other improvements in lessons would be wasted if pupils were not there to benefit. Mr Brice says it has been important to send an unambiguous message that truancy is not tolerated – and to make clear that the school would not shy away from tough action, including fines and prosecutions for parents. He says schools in disadvantaged areas are not helping anyone if they lower standards. “It might seem tough not to accept excuses,” says the principal. “There might be more barriers – but that’s even more of a reason to work really hard. 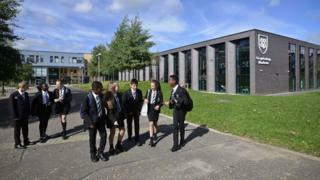 It’s an approach that has seen the school going from near the bottom in school attendance among England’s secondary schools to a record that puts them near the top. A decade ago, the school (in its previous identity) had about one in five pupils who were persistently absent. Now it’s in the top 1% for attendance. But the first thing a visitor might notice arriving at the school is the Co-op logo on the wall and on the badge on school blazers. The logo is immediately familiar from the high street shops – but the Co-op also runs 13 schools, with a particular focus on improving schools in less affluent parts of the north of England. When the Co-op took over the Manchester school in 2010 it gave it a new name, new buildings and a new leadership – and with that a new culture. There was a much stricter behaviour code, rules on uniform were enforced and there was a push for a greater sense of calm. 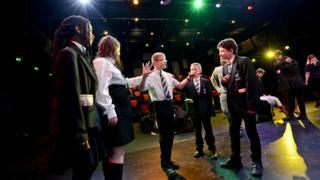 There was also a £24m rebuild, followed by a further £18m extension, including a professional-standard theatre that can be used by the community as well as the school. 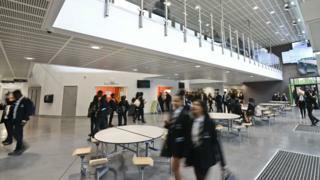 It’s attracted more pupils – with numbers at the school more than doubling since the relaunch. The Co-op also introduced its own ethos. It’s almost as if the Co-op movement’s history of social reform, drawn from its 19th Century founders, has been used as a form of faith or belief. The school’s houses – called “families” – are named after people from the movement’s past and there are visible messages about fairness, respect and community. But these radical, progressive roots are expressed in very traditional ways. The vice principal, Mel McMorrow, talks about good manners and making sure pupils wear the right kind of shoes and tuck in their shirts. The culture shift, she says, meant that pupils now wanted to be in school. There has been a big push on improving the teaching – and a policy of not using supply teachers, and instead having their own pool of staff to provide cover. Mr Brice talks about the need for “robustness” in setting standards. While the Co-op might be associated with progressive politics, he says the school also draws upon values of “straight talking” and “self-responsibility and self-help”. Pupils at the school might have parents who had a negative experience in their own education – and he says there is a need to tackle such “inter-generational” lack of engagement with school. Ms Robey says that attendance problems can be the starting point for other underlying family difficulties. Parents might say the child is “stressed” or “anxious”, but it might turn out to be the parent who has the problem and might need help. Frank Norris, the chief executive of the Co-op’s academy trust, says the group wants to expand further in schools in the north of England. He says the aim is not only to raise educational achievement, but to use schools to support regeneration in the wider community. 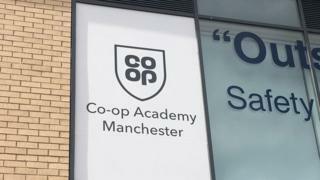 For example in the Co-op Academy Manchester, there is a mini-business centre on the school campus where local entrepreneurs and start-ups can work. Mr Norris says the schools are linked by the co-operative ethos, but in a way that connects with young people. Rather than talking about “solidarity”, he says the schools might talk about succeeding together.